Cardin received a massive Playmobil zoo set from Santa this year. Two of the animal figurines were getting frisky last night. Luckily I caught it on tape. Picture this….interspecies animals gone wild. Here you will see the before image. Take note of the lighting and how the shading shows the contrast between the animals skin. Also shown is the giraffe’s sweeping, brown tail and firm stance. My tennis coach would be so proud of this dude for having his feet shoulder width apart. And then you will see the after image. 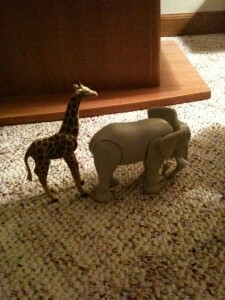 Again, take note of the giraffe’s taut and firmly positioned tail. Coincidently, the placement of the tail is at a near perfect height for maximum activity. Naughty. Maybe there should be ratings on children’s toys. Or maybe their parents should not be allowed to play with them.